Bubbles snap and people chat! 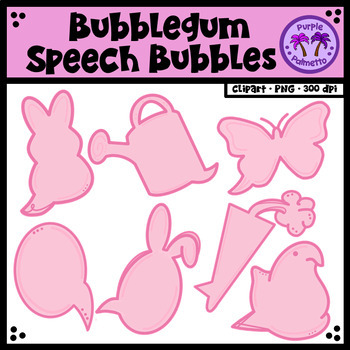 This set of clipart contains 7 BUBBLEGUM SPEECH BUBBLE images in all. Product contains 7 colored images. All images saved at 300 dpi and come in png formats with transparent backgrounds so you can easily layer them into your projects. Images are contained in a zip file. Before purchasing, please check that you are able to open zip files and ensure that your zip opening software is updated. Don't miss out on freebies, sales, and more! Follow Purple Palmetto on Instagram. © 2019 Purple Palmetto. Use for a single user. Additional copies must be purchased if you plan to share with others. No part of this resource maybe posted on a blog (personal or commercial), webpage/site, server, or other location that is accessible by multiple people without express written permission from the copyright owner. Violations of this notice are subject to the penalties of the Digital Millennium Copyright Act (DMCA).